Groupings allow you to make an activity visible to specific sets of students (groups). To create groupings, you need first to create the associated groups. See Create and use Groups. For example, you may create one set of groups to use (view) a wiki and another to use (view) a forum as per the example below. Click Groups in Course administration/Users. Then click the Groupings tab at the top. Type a Grouping name and Save changes. Add Groups to the Grouping by clicking the Show groups in grouping icon found on the right hand side of the screen. 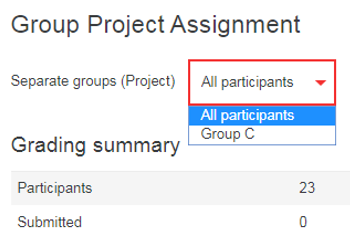 Select groups for the grouping by highlighting them on the right and clicking Add. 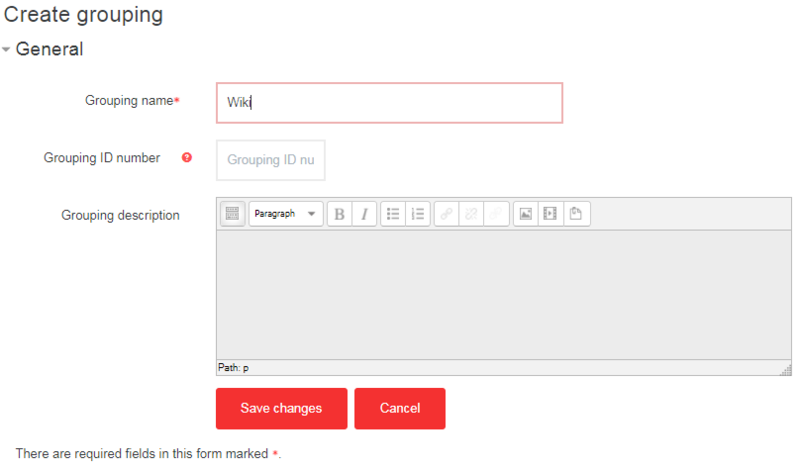 Click Back to groupings and continue creating groupings as required. 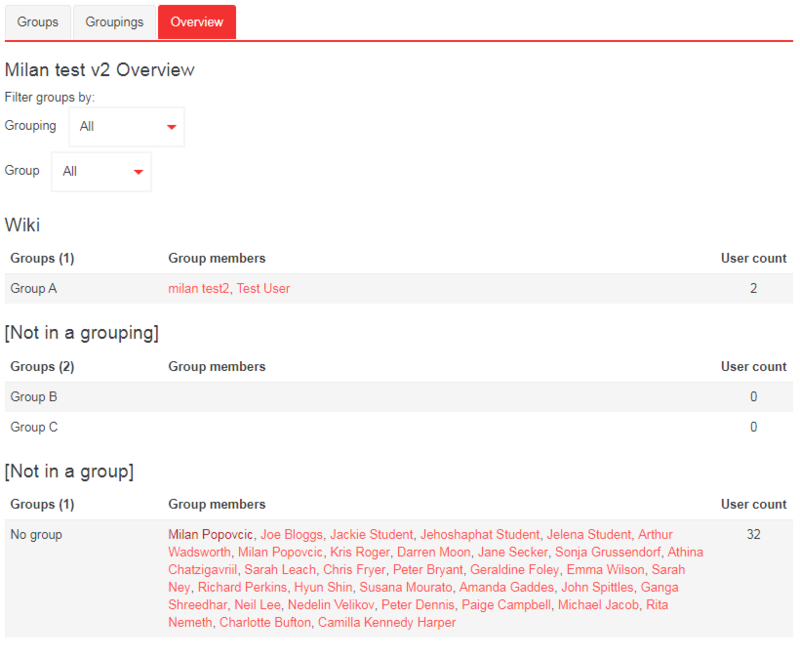 On completion, check that the groupings are as required using the Overview tab on the Groups. 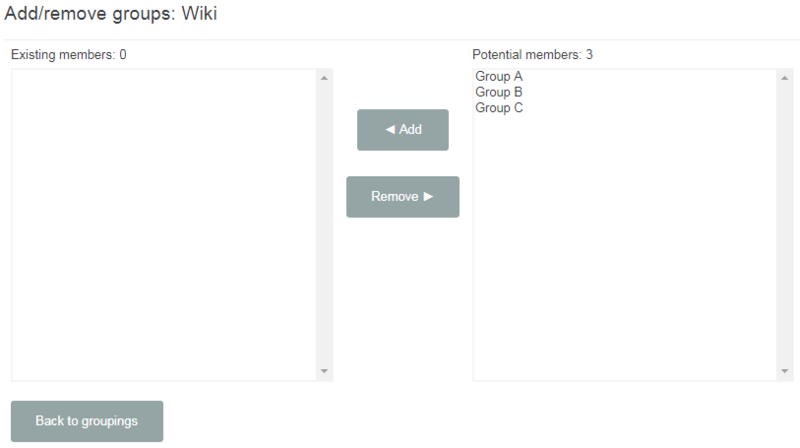 In the example below the two groupings ‘Wiki’ and ‘Project’ will be used to enable different group configurations for a collaborative wiki and a project forum. In Common module settings, choose Separate or Visible groups in Group mode, select the appropriate Grouping box and Save changes.N.B. Clicking the Add group/grouping access restriction will make this activity completely invisible to students outside of the grouping you choose. If you accidentally click this button, they way to remove the restriction is to remove it from the Restrict Access set of options found directly underneath. Repeat this for each activity to which you wish to apply a grouping. When groupings have been applied to activities, they will appear on the course page as below with the grouping in brackets beside them. Each group within the grouping will have its own version of the activity. To monitor progress you have the option to view All participants or individual groups.